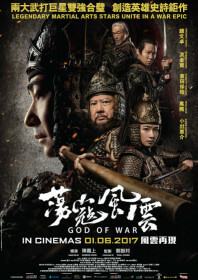 Fans of military strategy should enjoy this sumptuous Gordon Chan blockbuster – a battle-scarred, patriotic, visceral attack of a war movie which feels a bit like John Woo’s 2008 Chinese film Red Cliff, even if it does deal with a different time period and a new enemy. This focuses on the events following the invasion of the eastern Chinese province of Zhejiang by Japanese pirates in the 16th century. They are led by Samurai who follow the Bushido code but are reliant on ronin with loose morals to enact their invasion. Their honourable leader, Commander Kumasawa (a brilliantly mature and nuanced performance from the martial artist Yasuaki Kurata), quotes Sun Tzu and never underestimates his enemy, unlike his more hotheaded subordinates. Flying the flag for the Imperial army is the Ming dynasty’s latest war leader, the scholarly Qi Jiguang (Vincent Zhao), who takes over the fight when the previous commander Yu (Sammo Hung) is deemed to be defective and thrown in a state jail. Qi is tasked with training a new army made of initially uncooperative recruits from a small mining village, who are transformed into a forthright, elite fighting force ready to take on the Japanese and their 20,000-strong army. Chan’s film never fully conveys the magnitude and everyday reality of the war outside of top-level, strategic meetings and Qi’s personal relations with his war general wife, the tough Lady Qi (Regina Wan). It means it becomes difficult to fully engage with the plight of these characters. Having said that, Chan does make sure that fans get what they expect from a film starring three formidable martial arts leads. Vincent Zhao still possesses expert wushu and weaponry skills, and gets to neat pole-fighting display with Sammo Hung, whose stature and presence just seems to magnify with age. Kurata is also superb; his duel with Zhao at the end makes for a satisfying conclusion.